Tantalising sweet and smoky tacos made for nibbling and very vegan friendly. 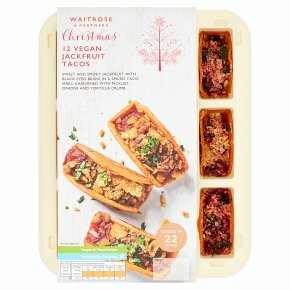 These are made with pulled jackfruit and black-eyed beans in a spiced taco shell garnished with pickled onions and a tortilla crumb. INGREDIENTS: fortified wheat flour (wheat flour, calcium carbonate, iron, niacin, thiamin), jackfruit (18%), water, diced red pepper, diced red onion, black eyed beans (7%), tortilla chips (maize flour, sunflower oil, salt), palm oil, diced white onion, tomato purée, rapeseed oil, sugar, parsley, red wine vinegar, demerara sugar, paprika, cornflour, soy sauce (water, fermented soya bean, roasted wheat, sea salt), vegetarian Worcestershire sauce (water, sugar, spirit vinegar, molasses, onion purée, salt, tamarind paste, cloves, ginger purée, garlic purée), Dijon mustard (water, mustard seeds, spirit vinegar, salt), garlic purée, smoked paprika, salt, ground coriander, ground cumin, beetroot powder, coarse black pepper, yellow mustard seeds.